Dryden Goodwin’s work includes drawing, often in combination with photography and video, he also creates etchings, screen-based installations, works in public space, works on-line and soundtracks. 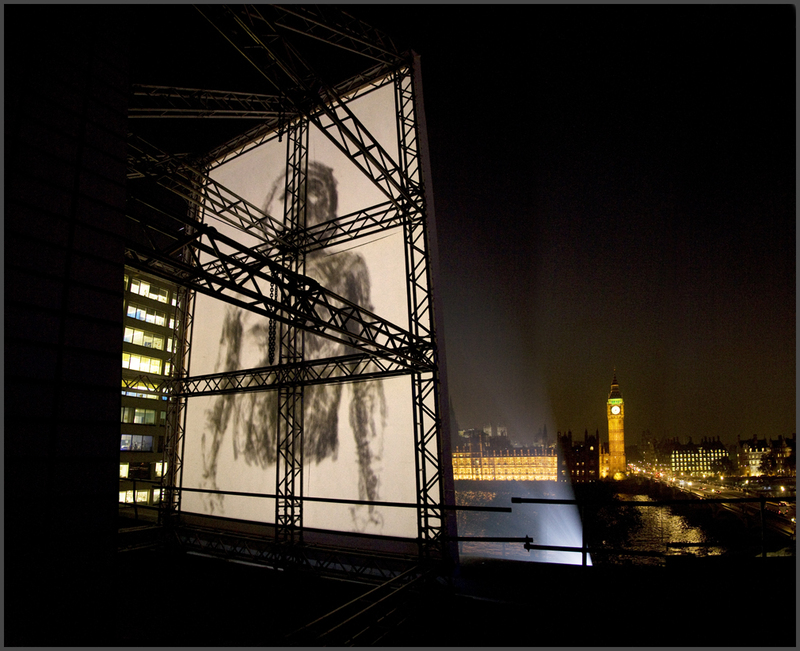 Recent projects include Breathe, a large scale projection, animating over 1,300 pencil drawings of his 5 year old son breathing, projected next to Westminster Bridge, opposite the Houses of Parliament, commissioned by Invisible Dust, 2012; Poised, a 28-minute film with soundtrack exploring the physical and emotional dynamics of a group of young female divers, looking beyond the arc of the dive itself to consider its metaphorical, even metaphysical resonance as a rite of passage between different states, commissioned by Film and Video Umbrella, first exhibited at the De La Warr Pavilion, 2012; Linear for Art on the Underground, a series of portraits of individuals with different working roles on the Jubilee line. Goodwin created 60 pencil portraits and 60 films recording the drawings being made. The films show the accelerated progression of these drawings, accompanied by fragments of the conversation between the artist and each ‘sitter’. The drawings were displayed at special exhibition sites, poster sites and media screens across the London Underground network and the films available on a dedicated website 2010-2012. In 2010 Goodwin was commissioned to make a series of works for the Who am I? Gallery at the Science Museum, London. Solo exhibitions include Coax, at Raum mit Licht, Vienna 2011 and Fotoforum West, Innbruck, Austria 2011; Cast, at the Hasselblad Foundation, Gothenburg, Sweden, 2009 and the Photographers’ Gallery, London, 2008. Group exhibitions include, Images of the Mind, Moravian Gallery in Brno, Czech Republic, 2011; Grand National, Vestfossen Kunstlaboratorium, Norway, 2010; London Calling: Who Gets to Run the World, Total Museum, Seoul 2009 also Hanjiyun Contemporary Space, Beijing, 2009. Goodwin has also exhibited at Tate Modern, Tate Britain, Tate Liverpool and the Venice Biennale. Collections include The Museum of Modern Art in New York, The Tate Collection and The National Portrait Gallery, London. He is a Reader at the Slade of Fine Art, UCL, London. Part of Drawing making - Making drawing a series of talks, in-conversations, discussions and workshops conceived of and devised by artist, writer and educator, Jack Southern. * This event will be followed by an opening reception till 7pm for the project Drawing making: Making drawing a chance to see work on display by some of the participating artists. This will include provisional, experimental and in progress works, as well as exhibition ready works.